What do arthritis, irritable bowel syndrome (IBS), diabetes, and ulcerative colitis have in common? Research has shown that food sensitivity testing followed by an elimination diet is key in determining the root causes of chronic inflammatory diseases. But given the complexities of food sensitivity testing and determining which foods may be the underlying causes, RDs are encouraged to deliver patient-centered care—one of the core principles of functional medicine that focuses not on treating the disease but treating the entire patient. This article will define patient-centered care in the context of functional medicine; its importance in the treatment and management of complex food allergies, intolerances, and sensitivities; and what it entails by presenting a real-life case study demonstrating this modality in action. Taking such an approach is important in the treatment of food allergies, intolerances, and sensitivities especially when faced with a difficult case, because it helps weed out what isn’t causing the problem and hones in on what is. The following is a complex case illustrating how one RD and her nutrition team uncovered the underlying causes of chronic IBS and other health issues and restored the patient to optimal health. An internist refers a patient to an RD to receive dietary instructions for the treatment of IBS. The RD completes a patient history and symptom survey. Upon review, the dietitian discovers the patient has been experiencing vomiting, muscle pain, and flulike symptoms (malaise). Numerous physicians have told the patient she’s in perfect health and concluded that she’s creating her own symptoms due to stress. The patient’s IgE allergy test results show a positive reaction to corn and four other items, but she says some of these foods don’t bother her. The RD recognizes the patterns of inflammation and realizes that getting this person truly well may involve addressing underlying causes of inflammation and stress management. The patient’s Mediator Release Test (MRT) shows reactions to multiple foods and chemicals, indicating the patient must begin an elimination diet based on the LEAP (Lifestyle, Eating, And Performance) protocol. The LEAP elimination diet limits the patient to no more than 20 to 25 different foods that have been identified as minimal release triggers of mediators in a laboratory setting.4,5 The patient-specific elimination diet involves eliminating any known foods or chemicals the patient suspects triggers symptoms. However, because of a preplanned three-week vacation, a full elimination diet isn’t possible at this time. Using patient-centered care, the dietitian creates a chart with the patient at the center (See chart). Although many things must be addressed, the RD and nutrition team can’t solve all the issues at once, but must tackle one or two at a time. Thus, follow-up is imperative. Here’s the RD’s seven-step plan for this complex food-sensitive patient. 1. Start an elimination diet. The patient will only eat about 20 of the lowest reactive foods based on her quantitative food-sensitivity test. The standard elimination diet won’t be effective, since the patient is MRT-reactive to rice and pears, which usually are allowed in a standard elimination diet. 2. Limit chemically reactive foods. In this case, solanine and tyramine are reactive, so the RD must make decisions about the level of food restriction required, since some patients can tolerate many chemicals in small doses but not in large ones. 4. Consider the environment. The patient tested highly reactive to both yeast and mushrooms. The dietitian considers the need to inquire about excessive mold or mildew in the patient’s home or work environment, since mold and mildew may exacerbate symptoms. Yeast-based vitamin supplements also may need to be eliminated. 5. Test for celiac disease. Food sensitivity tests show that the patient is wheat and barley reactive. But before removing wheat- and barley-containing foods from the patient’s diet, the RD asks the patient if she’s ever been diagnosed with celiac disease and considers referring her for celiac and/or gluten-intolerance testing. 6. Nix the herbal supplements. The patient is taking multiple herbal supplements for her symptoms with nominal relief. 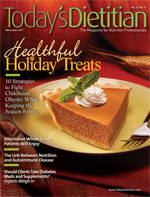 The RD suggests she discontinue them as part of the elimination diet protocol. If she doesn’t, she may never know whether the foods or the herbs are triggering her symptoms. 7. Consider prescheduled plans. The patient had planned a three-week vacation. 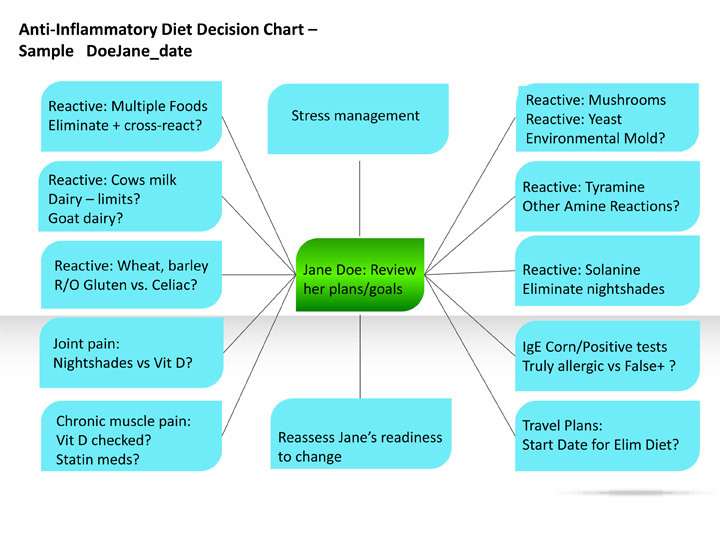 Adherence to an immediate full-elimination diet isn’t possible, so the RD considers postponing it while the patient avoids foods to which she’s most reactive and while other concerns are addressed. However, upon her return, the RD will encourage the patient to begin the full elimination diet. By implementing a multifaceted, patient-centered approach to client care, the patient eventually learns she doesn’t have celiac disease. She’s changed her eating habits significantly, eliminating many trigger foods and chemicals. She’s also learned that pears and one of the medicinal herbs she was taking were the triggers that caused the vomiting and IBS symptoms. The patient says that she never would have figured out what was causing her symptoms if the RD didn’t take a patient-centered approach. At no other time in history have there been more opportunities for dietitians in the area of food allergies, intolerances, and sensitivities. There are many hurting people who need help from experienced RDs who are using patient-centered counseling techniques to improve care. The best prescription for promoting optimal health isn’t to treat the symptoms of a chronic disease but its underlying causes. That way, RDs will have the greatest impact on their client’s long-term health and wellness. — Jan Patenaude, RD, CLT, is director of medical nutrition for Signet Diagnostic Corporation and coauthor of the certified LEAP therapist training and continuing education program. She was awarded the Excellence in Practice Award by the Nutritionists in Complementary Care Dietetic Practice Group (now Dietitians in Integrative and Functional Medicine) in 2008. 1. Levin B. Nutritional Management of Inflammatory Disorders. Gig Harbor, Wash.; Institute for Functional Medicine; 1998. 2. DeBusk RM. Fogarty CP, Ordovas JM, Kornman KS. Nutritional genomics in practice: Where do we begin? J Am Diet Assoc. 2005;105(4):589-598. 3. Institute for Functional Medicine. What is functional medicine? Available at: http://www.functionalmedicine.org/about/whatisfm/. Last accessed September 2011. 4. Ford D, Raj S, Batheja RK, et al. American Dietetic Association: Standards of practice and standards of professional performance for registered dietitians (competent, proficient, and expert) in integrative and functional medicine. J Am Diet Assoc. 2011;111(6):902-913. 5. Williams FH. Use of the LEAP mediator release test to identify non-IgE mediated immunological food reactions that trigger diarrhea predominant IBS symptoms results in marked improvement of symptoms through use of an elimination diet. Research presentated at: American College of Gastroenterology Annual Meeting; November 2004; Orlando, Fla.
6. Kong J, Zhang Z, Musch MW, et al. Novel role of the vitamin D receptor in maintaining the integrity of the intestinal mucosal barrier. Am J Physiol Gastrointest Liver Physiol. 2008;294(1):G208-G216. 7. Redmond E, Swift KM, Noland D. DIFM Unveils the IFMNT Radial. Dietitians in Integrative and Functional Medicine. 2011;14:S1-S2. 8. Theoharides TC, Cochrane DE. Critical role of mast cells in inflammatory diseases and the effect of acute stress. J Neuroimmunol. 2004;146(1-2):1-12.